COVENANT OIL speaks of the commitment and devotion of the parties entering into a Covenant Relationship, both in the Marriage Covenant and in the believer's Covenant with the All Mighty One. The Bible is filled with many scriptures that compare the marriage covenant on earth with the covenant between the Creator and His people. 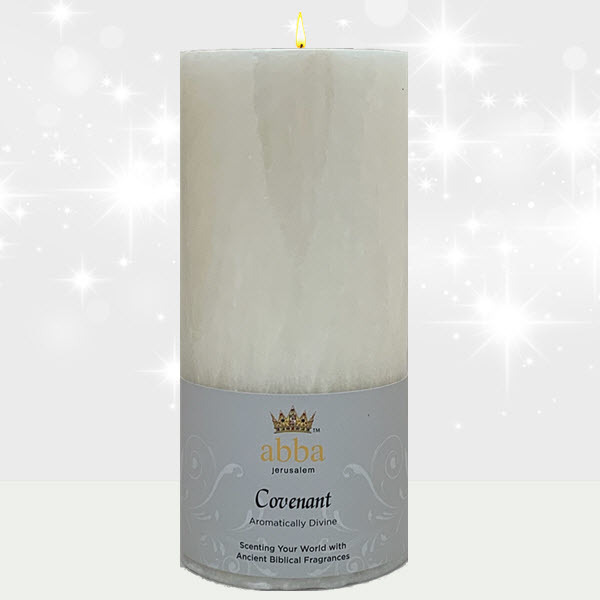 Abba's Covenant Oil is a delicate blend of 4 fragrances that represent the three participants of the Biblical Marriage Covenant: Bridegroom...Frankincense & Myrrh; Bride...Spikenard; and the Holy Spirit...Hyssop. Our hand-poured, palm-wax 3 x 6 pillars produce an exquisite design in each candle and burns cleaner than parafin. The elegant label conveys the spiritual information on this custom-blended ABBA fragrance, complete with scripture verse. Approximate burn time: 50-60 hrs.